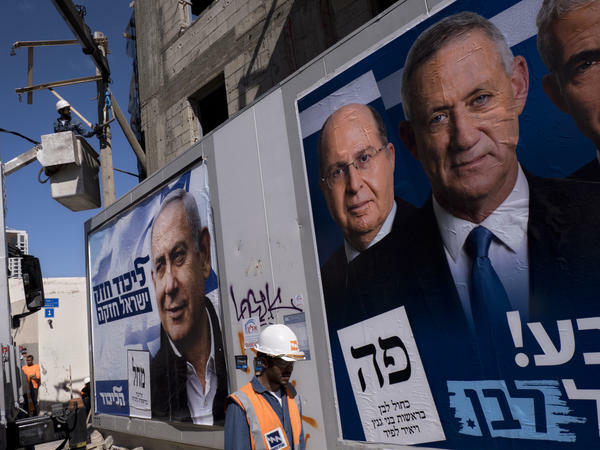 Election campaign billboards in Tel Aviv showing Israeli Prime Minister and head of the Likud party Benjamin Netanyahu (left), alongside the Blue and White alliance leaders Moshe Yaalon and Benny Gantz. Polls in Israel are closing in an election that is largely seen as a referendum on its longtime right-wing leader, Benjamin Netanyahu. The prime minister and Trump ally, who could become Israel's longest-serving leader if he secures another term, is facing corruption allegations. He's also facing a serious challenge from relative political newcomer Benny Gantz. Netanyahu has spent the last 10 years in power, and also led the country for three years in the late 1990s. Polling stations closed on Tuesday at 10 p.m. local time, or 3 p.m. EDT, with initial exit polls expected to be released shortly after. While the race itself is largely about Netanyahu's political future, Israel's 6.3 million eligible voters are choosing between some 40 different candidate lists, representing a broad array of parties, movements and individuals. The candidates are competing for the 120 seats in Israel's parliament, the Knesset. After election returns are in, Israeli President Reuven Rivlin will select a party leader to attempt to put together a coalition government. In the past, the process has sometimes taken weeks. Opinion polls are close between the two leading candidates, though the performance of other, smaller parties may give Netanyahu an edge in forming a government. As Haaretz reported, "The bloc of right-wing and religious parties had a small majority over the center-left opposition." But at the same time, the newspaper added: "Nothing is certain and the polls are questionable anyway." Gantz, a former military chief of staff, is neck-and-neck with Netanyahu in the final weeks of the polls with his Blue and White political alliance. The group, which is largely made up of centrist and right-wing former government officials, has campaigned on a message that it can unify the country. In the final hours of the race, Netanyahu has put out a series of videos to try to turn out his right-wing base by warning that its turnout is low, as NPR's Daniel Estrin reported. Netanyahu's campaign has previously used social media to cast Gantz as dangerous and inexperienced. As Estrin noted, "Netanyahu's party also put out a video it later apologized for - showing a military graveyard and claiming Gantz would lead a reckless left-wing government and cause hundreds of deaths." Gantz has fired back. He accused Netanyahu of embracing extremists through ties with the far-right Jewish Power Party. Perhaps most controversially, Netanyahu has recently promised to annex Jewish settlements in the occupied West Bank if he wins another term. That would deal a huge blow to Palestinian aspirations to form an independent state there and would short-circuit an outcome that the international community expects to be resolved through peace talks. "Is he serious? It's a last-minute campaign pledge," Estrin told Morning Edition. "It would cause an uproar in the world, but his party really wants him to do it." In his years in office, Netanyahu has moved the country away from a two-state solution to the Israeli-Palestinian conflict. In 2009, after taking office for a second time and under pressure from then-President Barack Obama, Netanyahu publicly called for the creation of a Palestinian state for the first time. But as Estrin reported, with the exception of a 10-month settlement construction freeze, the prime minister continued to expand Jewish settlements in the West Bank. It's an area that both Israelis and Palestinians have historical ties to, and Israel has occupied since 1967. Settlements are broadly viewed as an obstacle to peace by Palestinians and the international community. Netanyahu is also facing the looming possibility of indictment on corruption charges. In February, Israel's attorney general announced that he was preparing to indict the prime minister after studying three different corruption cases, related to allegedly accepting gifts from wealthy businessmen and allegedly conspiring with media moguls to trade favors in exchange for positive coverage. At the same polling station where Netanyahu cast his vote on Tuesday, Estrin met one of his supporters, 29-year-old Tzvi Gudin. "Netanyahu is a leader once in a generation" Gudin said. "I want him to be the leader of the decades." Another voter, Yael Levin, told Estrin that she expects Netanyahu's Likud party to gain the most support in this vote – but she hopes that Gantz's party would consider joining Likud in a coalition, as a moderating force. "Hopefully we can move forward rather than backward," she said.